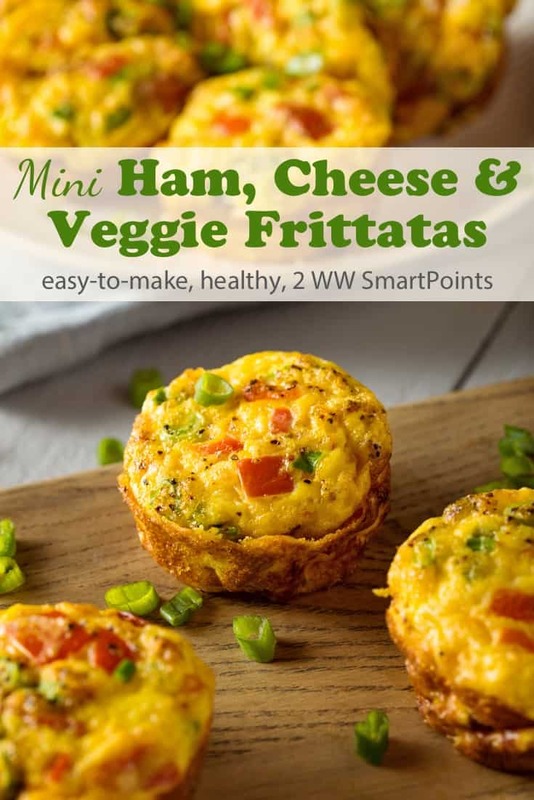 As soon as I saw this recipe for Weight Watchers individual ham cheese veggie frittatas in a recent Weight Watchers Weekly, I knew I wanted to give them a try. Last night was the night. I love having breakfast food for supper every once in a while, a holdover from when I was a kid and it seemed like such a treat. A layer of defrosted frozen hash brown potatoes forms the crust for these easy ham, cheese and veggie mini frittatas. What is it about individually portioned foods baked in muffin tins that seems so fun? 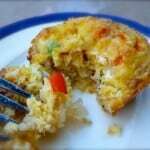 A tasty mixture of eggs, lean ham, onion, pepper and low-fat cheese makes up the filling. As the Weekly suggests, you can whip up a batch of these mini frittatas on Sunday night and then you’ve got breakfast ready and waiting in the fridge for the week. Then just pop them in the microwave for a few seconds and voila – an easy, healthy, tasty breakfast. I thought my first attempt at these hash brown crusted egg cups turned out pretty well and I ended up having two for dinner. The rest were packed away for breakfasts and/or snacks. I like my hash browns crispy, so next time I will bake them a little longer. And some of my muffins stuck to the bottom of the tin a bit, so be sure to use non-stick muffin pan and spray in generously for best results. Each individual frittata has *3 PointsPlus (*3 SmartPoints) value according to Weight Watchers.com. These are now just *2 WW Freestyle SmartPoints on the New WW Freestyle Program. Enjoy! 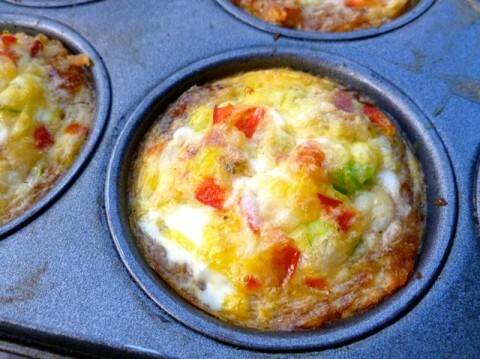 If you’ve made these mini muffin tin frittatas, please give the recipe a star rating below and leave a comment letting me know how you liked them. Position an oven rack in the center of your oven and preheat oven to 350F degrees. Generously coat 8 muffin cups with cooking spray. 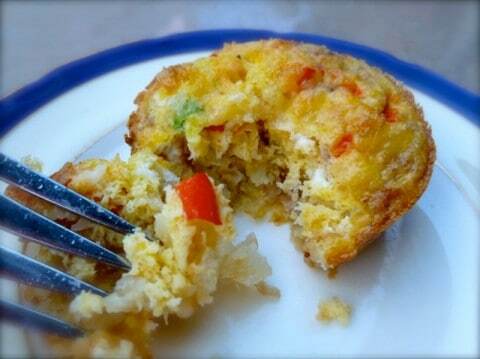 Press the defrosted hash browns into the bottom and up the sides of each muffin cup to form a crust. Meanwhile, make the filling: In a medium bowl beat the eggs and milk together. Season with salt and pepper. Stir in the ham, peppers, onion and cheese until well blended. Remove the potatoes from the oven and press the potatoes down firmly with a spoon so that they are like mini pie crusts lining the bottom and sides of the muffin cups. Divide the mixture evenly, pouring it into the center of each of the eight prepared muffin cups. Return to the oven and bake until the potatoes are crisp and golden and the egg mixture is set, 15 to 18 minutes. Remove from the oven and let sit about 5 minutes before serving. I didn't have any green pepper, so used 4 tablespoons red instead. Next time I think I'll add a little garlic powder and seasoned salt to the hash brown potatoes before baking them. I put this into My Tracker in Weight Watchers and it tracks the recipe at 5 points. Any suggestions to bring it back down? I was thinking about using Egg Whites, but not sure of the amount. This recipe is right from the Weight Watchers site where they show it as having a PointPlus Value of 3 so not sure why your recipe builder is giving you 5. When I make a recipe from the WW site I trust that the PointsPlus value is accurate and don’t re-calculate it with nutrition software. 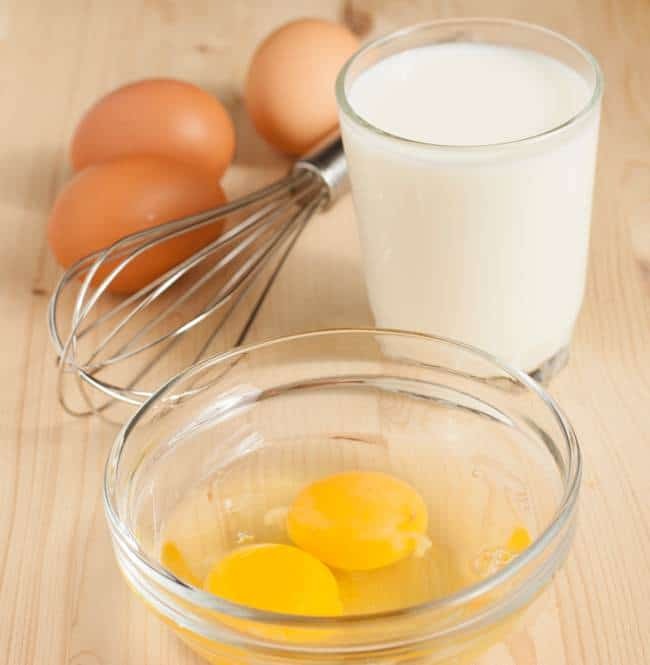 If you want to use egg whites, you would want to use 1 cup to equal the volume of 4 large eggs. I tried this recipe and I actually think it could’ve used a couple more eggs. I had plenty of potatoes left over, but I guess I didn’t make the “crust”as thick as they wanted. If you want to save money on the hash browns, it actually worked really well just to blend some potatoes into a thick mush and bake that. The mush formed into cups quite nicely but it might need a few extra minutes to get crisp. I am interested in trying this as it sounds promising. However, I am somewhat confused – it states to coat 8 muffin tins with non-stick spray, but then advisesto pur 1/4 of the mixture into the cups – please let me know if the yeild is 4 or 8. Thanks.